I have a partiality for series in my crime fiction reading. I’ve heard that a publishing trend is moving towards more standalone novels, and while I can see some advantages in them, what I want to read above all is a new book in a series that I love. I don’t read in a methodical way; the only series that I’ve deliberately read in order are the Maj Sjöwall and Per Wahlöö Martin Beck books. The downside of series, of course, is that they can go off the boil. I don’t intend to list them here, but I can name a fair few that have started well and then when you reach, say book 12, the quality dips. At that point, with so much else out there, I usually stop reading them. However, there are some writers who manage to keep the impetus going, the topic of a recent post at the crime fiction blog Reactions to Reading. 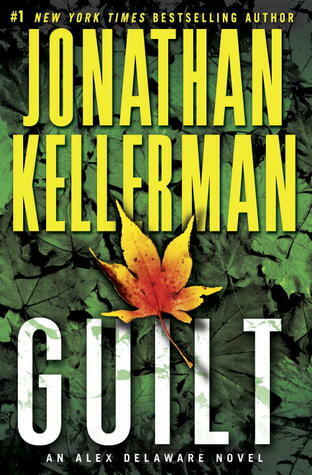 My nomination for a series that is a ‘must read’ are the Alex Delaware/Milo Sturgis novels by Jonathan Kellerman, the latest of which, Guilt, was published in the UK at the beginning of March. A pregnant woman unearths the body of a baby in the back garden of a house she is buying and the evidence points towards a tragedy that occurred sixty years earlier. Nearby, a recent set of baby’s bones are found in a park and a woman working as a nanny is found shot dead. The cases seem miles apart but in wealthy LA, the highest echelons of society are prepared to pay, obfuscate or murder to conceal their actions. The principal attraction of Kellerman’s books is the relationship between Milo and Alex. Milo is a gay LAPD detective whose outsider status allows him a free hand with investigations. Alex Delaware, is a consulting psychologist who assists with cases and often helps solve them. Their close relationship has been well drawn from the very first book,When the Bough Breaks and their affectionate banter in the midst of violent crime is always good to read. The plots of the books, although well constructed, are often difficult to distinguish from each other. Guilt, however, involving an historic and present day case was better than some and I enjoyed the insight into the lives of the super rich and famous. Early in the series, the books were far more psychology focused and although Kellerman has moved away from this, it would be nice sometimes to see Alex in his psychologist’s guise rather than zooming around LA to solve a case. Overall, considering this is the 28th book, I thought it held up pretty well and will no doubt delight Kellerman’s legion of fans. Thanks to the publisher Headline for my copy. Oh yes Margot – I would like that. Especially one of the earlier books that are very good indeed. Blimey – 28th? Every so often I think ‘oh I’ve fallen behind a bit with Kellerman’ but I hadn’t realized by how much! I do enjoy them, and this one sounds intriguing. Baby bones were found in my garden, a long time ago, before I lived here, and they were old then, but it’s always a sad thought. (And, as my friend said, ‘don’t tell potential buyers about that…’) Anyway, all in all, onto the list this one goes! What a fascinating story Moira. It is a sad thought even if the bones are old as it suggests a long forgotten tragedy. I liked this one, and I’ve read over 20 books in the series too. Now that I think back on them, I do prefer the first few books, but I assume Kelleman hasn’t been practicing in years so he has less cases to draw from in his writing. I hadn’t thought about that Rebecca but of course you’re right. And I guess practices might have changed too. Still an enjoyable series though. I also lean more towards series, although the way I am reading now, I read only one or two from a series (because there is just so much out there to read). So that is not much different from reading a standalone. I am glad you reviewed this one, because I had wondered how the series had progressed, with so many books in it. I have only read the first one, and have the next one in the series. Same with his wife’s series about Peter Decker and Rina Lazarus. Interesting point Tracy as I often just read a couple from a series too, just to give me a flavour of the books. I am obviously in the minority again, I think I prefer standalones. I obviously read a lot of books that are in series because the vast majority of the kind of crime fiction I like is in series but I really do get a bit bored with them all. I’m afraid I gave up on both Mr and Mrs Kellerman some years ago…when I started dreaming of drowning Alex Delaware in his koi pond I knew it was time for us to part 🙂 Though Kellerman wrote one of my favourite standalone novels – set in Israel – called The Butcher’s Theatre – a bit too violent I expect but this was before every second novel was a serial killer slasher fest and I enjoyed the setting and the main character. I haven’t read ‘The Butcher’s Theatre’ Bernadette. I must give it a go. The koi do feature a lot in the book don’t they? If it’s not the koi its the dog – a pug, I think? I’ve read this since about the sixth book when my friend, whose day job is driving a bin lorry (my son loved him stopping by with it when he was a toddler, and he’s 24 now!) introduced me to them, saying he thought I’d like them. I’ve read them all, barring the last five or so, as I’ve got a little muddled up to where I am! I think I’ll just dive back in with this one; I do love cold cases. I hadn’t noticed but Alex HAS moved away from the psychology cases of earlier books. I thought it great to see a gay character in a major series back then; it was quite groundbreaking. Faye Kellerman’s books I enjoy but they’re not a must-read – I’ve read 5 or 6. Glad you’re a fan too, Sarah. And Margot and Rebecca! I’m muddled up wth them too at the moment. I don’t think I’ve read the last 2! I must check. I’m with the eminent blogger from Oz on this one. I gave up on both Kellermans many years and books ago. Yes she is an eminent blogger isn’t she? Oh, I much prefer reading series than standalone novels when it comes to crime fiction! I love that feeling of discovering a great book and knowing that there are loads more out there with the same characters. Although, I can’t think of any of my favourite series off the top of my head that have ‘gone off the boil’ to the extent that I’ve given up on them – though of course they all have blips here and there. I’m not familiar with Jonathan Kellerman so will have to add him to my ‘to-try’ list. Thanks Marie – do try one of Kellerman’s early books. He has a lot of fans. My husband Ken is a devoted fan of Kellerman’s. In fact, he just picked up Guilt at the library today. Ken says Kellerman is a cut above Patterson, Baldacci, and many other authors who regularly make the New York Times Bestseller List. I haven’t tried him yet, though this is one I might try. Thanks Judith. Yes I agree with your husband’s comments. I’d be interested to hear what you thought of Kellerman. although I like the earlier books more, this one does stand up well. Hi Shelleyrae. I like Faye Kellerman’s books too, I just haven’t read as many. I must try and catch up.